Is hate really the word you are meaning to use when explaining yourself to your kids or to others in both parenting and life in general? Is hate doing it for you? 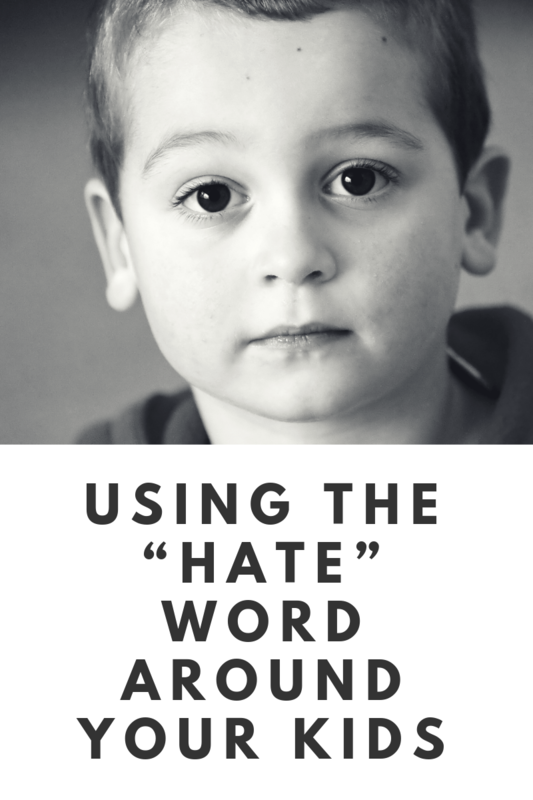 There’s a lot of bad things in this world and a lot of things we may not agree with, but is hate really the word your looking for when explaining yourself to your kids or others? Growing up, let alone just becoming a parent can really open your eyes to the hate in the world and at times it can take over and become tiring. Hate isn’t a pretty thing and it’s something that really irks me every time I hear one of my kids say it. I know it’s because they are just copying what they hear come out of mommy and daddy’s mouth, but maybe that’s the lesson to be learned in hearing their sweet little voices, the ones I have created mind you.. utter the words “I hate that” Or even worse..
It’s always when they have the ‘too young to be looking like this’ smirk on their face that makes it that much more disgusting for me to hear. And I always tend to respond with the same mother-like response, “Um, excuse me?” I can’t help but follow up with the question about what exactly hate means to them. It really can be quite humorous to hear a child’s version of hate depending on your humor. Usually it’s because someone bumped into them, took a toy they were playing with, or the color of their cup just isn’t what they wanted so they “hate everything”. Do your kids say this too? Ugh, i cant be alone over here. I’m assuming it’s a word that’s used somewhere around their little ears. In my home it’s from me. Something i say and utter frequently is how much I hate certain things when in reality they are just things that are overwhelming me because I haven’t had the chance to fully deal with them yet and when I get behind on my to do list.. well I really tend to hate that too. Saying i hate this and that I hate that, way too much. And really, I don’t like admitting that the more thought I have put into this post. Powerful in such a way that creates a blindfold to the positives in life. Hate creates a negative atmosphere that we are constantly trying to dig ourselves out of. I didn’t realize it until the words had come out of my 3 year old mouth and my heart sank. Is hate the word she will use? The feelings of anxiety and anger have come out over the stupidest things in my life. Think about it, of course, most of us who are tired and exhausted really reassembly dislike doing housework like laundry and dishes. When we say or think to ourselves how much we hate it, we bring upon feelings of disgust and resentment towards the sole action of doing it and the people who contributed to it. I can’t help but act out in some manner when I say how much I hate something. The human brain is amazing at reacting to its thoughts, that’s why there is so much power in our thoughts. It’s always in my body language where it shows first. You can ask me and I will tell you I’m fine even when he can clearly see and hear that I’m not. This past year has been a major stage of growth in my life and one of the things I have been working hard on is positive intentions. Having positive intentions isn’t always the easy way out. It takes a lot of work for some of us to be positive, uplifting and encouraging. Overcoming fear and then dealing with anger and then overcoming that anger is already such an amazing sign of growth, but can you imagine how much more you could grow if you chose to look at the negative things in your life as something that’s literally happening for you instead of to you? It’s a lot like that picture that has been circulating the internet. It says something along the lines of: Laundry to fold.. clothes to wear. House to clean… home to live in. Dinner to cook.. food to eat. Mess to clean.. family to love. Can you feel the positive energy in just reading those words? I have been thinking about these things every-time I feel like complaining. I am honestly so thankful to have the life I do; regardless. I have the tendency to complain a lot at times.. its something that always been a battle for me. I think we can all be guilty of that. For a short period of time, and at times multiple times, have held that throne. Sailing through my moments in life where I felt like I really hated my life were some of the hardest. I hated what had been done to me, how those who had abused me the most where viewed as good people in society. I hated that i didn’t have a dad who loved me like I had always wished for and i hated all of the abuse that happened to me. Slowly i just hated all of who I was because of it. Talk about exhausting and barely surviving. Being in this space of negativity was nothing anyone could bring me out of. It was something I had to do for myself. I no longer had an option. As you may have read in my past blog posts, my trauma and my negativity I was carrying with it all caught up to me and because my physical health was struggling so bad it really felt like my body had taken its toll and hate had finally won. Facing those fears and facing the truths and pain from my past and painful experiences was one of the hardest things I have ever done. Letting go of my family and no longer begging for their acceptance because they didn’t understand my healing process was second to it. Expectations were slim to none and i had no idea what was on the other side of talking about these things with someone else, but I knew that I needed to get it all off of my chest. It was always a huge fear of mine to share my true feelings; especially sharing it with the world. When you know something is on your heart for a reason, you just know. Hours upon hours upon hours were spent talking to Jordan. Many nights up late, many days not sleeping and many tears had fallen. I had so many questions he had no clue how to answer for me at times. There’s so much we both relate on due to the pain from his past as well, but he has just always been so much mentally stronger than anyone I had ever met and i have always been so amazed by it. He has handled the worst of trials most of us couldn’t even fathom dealing with and he deals with it with so much courage and strength and he always has so much wisdom in how he moves forward. Maybe that’s why god wanted us together. I finally found my place of comfort, safety, and understanding because of him. Ugh, I could write about my love and admiration for him for hours but I don’t ever want to bore you all with my obsessing of my husband. Sometimes I just can’t help it. I truly feel so blessed to have the relationship that we have. Through this experience of sharing my story I have gotten to learn one of the most valuable lessons to be learned in self development and that is to no longer hate myself or the things I have been through. Of course it still slips at times, but truly and intentionally removing this word from my thought process has invoked such a more positive atmosphere in my feelings on things. I’m beginning to realize that you don’t need to hate things to not like them. You can choose to just not like something and not agree with something and to just stay away from it. You have the control over what you are allowing in your life and once you hone in on your ability to take that control, I think you will. Hating just isn’t a healthy feeling. So, what do you hate today that’s taking over your happiness? How can you move forward from that hate to a place of grace and positive intention? Is hate really the word you are meaning to use when explaining yourself? I love feedback! If you have any thoughts to add to this post, please post below and if you feel it in your heart to share with others who may be struggling with the same demeaning thoughts.. please share!